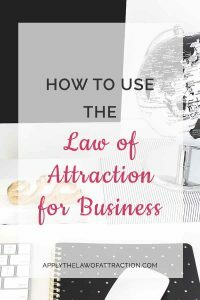 Have you ever wondered how to use the Law of Attraction for Business? Can competitors keep you from succeeding if your belief is strong enough? His question: I came across your post, It’s Time to Be Rich!. So in other words right now I can start a business that offers the same service as another with literally no difference between my company and the other person's but mine can become as successful as I want it to be so long as I unconditionally BELIEVE that I will meet my revenue goals with no doubt whatsoever, right? You're right that competition doesn't matter when it comes to business success with the Law of Attraction. You have the full ability to make your business as successful as you want it to be – regardless of whether you have zero or one million competitors. You control your company's future. Unconditional belief with no doubt is definitely a key component of the Law of Attraction. Once you reach the point where you truly believe your revenue goals will happen, you have made achieving your revenue goals your reality. It's the idea behind “assuming the feeling of the wish fulfilled” taught by Neville Goddard. When you know you'll meet your revenue goals with the same certainty that you know a traditional 9-5 job will pay you every two weeks, you amplify the power of the Law of Attraction for your business and pull financial success towards you. However, you still need to follow the other steps of the Law of Attraction to reach your revenue goals. You've probably already met the first step and gotten clear on what you want and determined the exact dollar amount you want to earn, but if you haven't, make sure you get absolutely clear on what you want to manifest for your business. You need to follow your hunches and take action towards meeting your goals. If you receive an idea to do a new marketing plan or are offered the chance to be interviewed on a radio show, go for it. Keep your vibration high and focus on feeling good. I can't stress enough the importance of these two things. The higher your vibration and the more you allow yourself to feel good about everything in your life, the more good you will draw to you in all areas. You'll find that not only will you make the Law of Attraction work for your business and revenue goals, but you'll start to see great things happen in your personal life, with your health, in your relationships, and so on. Use heart energy to amplify your results – speeding up how quickly you reach your revenue goals and ensuring you surpass them. Heart energy is the secret of the Law of Attraction. It will give power to your desires, your visions and your vibration, drawing money to your business from all avenues. Send heart energy out to your business, your clients/customers, your employees, your revenue goals, and any other key component in your business. Combine unconditional belief in reaching your company's revenue goals with these other steps and the Law of Attraction will help your business succeed, regardless of your competition.